Conventionally, the company’s manufacturing plants use the product counters to count their product quantity manufactured. Normally these types of systems are equipped with 7-segment displays. Hence whenever the company boss wants to see the product’s current quantity, each time he has to go to each product line and note that data. Hence we have made an innovative and a very user friendly automatic computerized system for above issues. We collect data from all the product line sensors together and display it on a computer screen of the company boss. 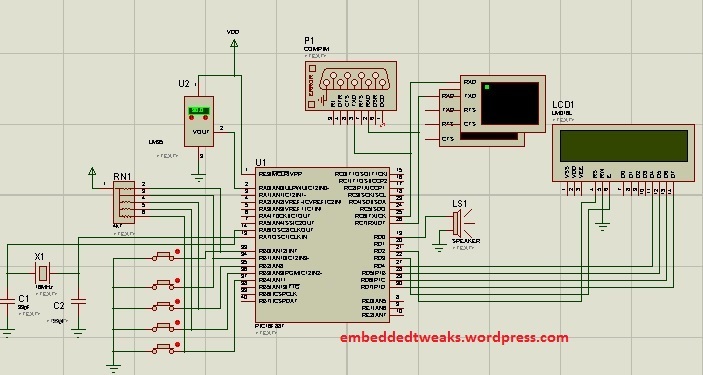 We have made PIC16f887 microcontroller based hardware for all these tasks. So he gets real time data of the product quantity counted every second. Now he doesn’t need to go to each product line and note down the data. Every orders and product quantity data is stored in a safe database and displayed on screen and updated with interval of every 10 seconds. So we can check past data on anytime whenever required. Boss can also generate an Excel file of the product data of the whole day with just 1 click. These details can be useful for the account section staff, because they can calculate the data of every day and use it with ease. This software requires a User name and password. So only authenticated persons can start and use this software. Almost no extra human resources needed due to everything automatic and computerization, Hence corruption is also stopped. The circuit diagram is as shown in the proteus simulation here. In the block diagram the object sensors are shown,they are made using IR leds and photodiode pairs. They are mounted on the conveyor belts. They are easily available in the market or even easy to make it at home. Anyhow one thing will be same that that sensor will toggle to logic ‘0’ or ‘1’ when the passed through the belt. Hence for simplicity i gave taken 4 switches in place of sensors for the purpose of simulation. when the switch is pressed it means product is passed through, it returns logic ‘0’. Hence the corresponding command will be sent via the serial port, which can be decoded in PC. The code written in MPLAB X is shown as below. The we wait for the data coming on our serial port i.e., MSComm1. for that we are writting following code. Immediately on getting data we, store it in to a variable called as data. Then we process it to check conditions. Whats up very nice site!! Man .. Excellent .. Wonderful .. I will bookmark your website and take the feeds also¡KI am happy to seek out numerous helpful information here in the publish, we need develop more strategies in this regard, thank you for sharing. . . . . .
I’ll immediately clutch your rss as I can not find your e-mail subscription link or e-newsletter service. Do you’ve any? Please let me know in order that I may just subscribe. Thanks. My hubby and I really want to tell you in which I’m really inexperienced to blogging and certainly adored your work. Very possible I am inclined to remember your web post . You really have fabulous content stuff. Appreciate it for expressing with the two of us your web document. I personally liked up to you’ll receive performed right here. The information is neat, your very own written message is remarkable. My partner liked as much as you will obtain performed proper here. The work is attractive, your created content is fantastic. I was recommended this blog through my cousin. I am not positive whether this put up is written by him as no one else recognize such distinct approximately my problem. You are wonderful! Thank you! I just want to say I’m all new to blogging and really enjoyed your web site. Most likely I’m likely to bookmark your blog post . You actually come with really good stories. Thank you for sharing your web page. I simply want to mention I am just newbie to blogging and site-building and seriously savored you’re blog site. Almost certainly I’m going to bookmark your blog post . You amazingly come with fantastic posts. Thanks a lot for sharing your webpage. I just want to tell you that I’m new to blogs and certainly savored your blog. More than likely I’m going to bookmark your blog post . You really have perfect stories. Appreciate it for sharing your webpage.